Seven Tips for Lazy Gardeners . . . and a Giveaway! In my part of Pennsylvania, Mother’s Day marks the official start of gardening season. The danger of frost is past, and seedlings and flowers can finally go into the ground. Hooray! Since I love flowers and vegetables, but am a very imperfect gardener, I’m offering seven tips for lazy gardeners like me. You can fake your way through this, folks! If you’re slow to get started with your vegetable garden, you might get some volunteers from last year. Weed around them and leave them in. No work, fresh vegetables . . . like this lettuce that grew up among my weeds. Yum! 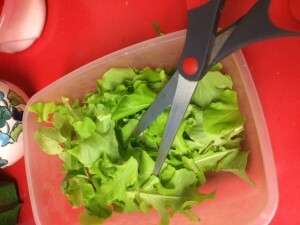 Volunteer lettuce . . . a gift from last year’s crop! Go for early crops. It’s not too late to plant snow peas and lettuce, and they’ll reward you quickly, before you get even lazier and more bored with gardening. Lettuce is supposed to bolt and be neglected by midsummer. A cute little dog helps disguise the weeds, too. shopping. Choose the wild, overflowing ones and your weeds will blend right in! And while you’re at it, pick up some artificial plants and flowers from the craft store—they’re on sale at this time of year, too. No upkeep required, and really, can you tell which of the flowers in the picture to the left are fake? Remember, gardening is exercise. If you can’t get motivated to dig in your garden, try thinking of it as a workout. When I was dieting, I was amazed at how many calories gardening burned. Log it into your Weight Watchers or Spark People account, or check it out on your FitBit. If you garden, you can skip the gym! If you really want to spend the summer on the couch, start a compost bin. You can earn the respect of any serious gardener by explaining that you’re taking time to “condition the soil” before you start your garden. Finally . . . get outside and enjoy! If you set up your chair or hammock near a neglected garden spot, chances are you’ll pull a weed or tuck in a plant just out of proximity . . . and soon you’ll be on your way to a bigger gardening experience. Or, you could just read a book featuring gardening! One of our Inspy Romance bloggers, Valerie Comer, has a whole series of Farm Fresh Romances, and you can read the first one for free right here! In my novel, Engaged to the Single Mom, the heroine has an important conversation with her spiritual mentor while the two of them are weeding the vegetable garden. Angelica is worried about her upcoming visit to the country club, because she’s sure to meet the her ex-fiance’s family for the first time since the breakup they all blame on her. She decides to take fresh vegetables as a peace offering, and it works! Well, after a big argument . 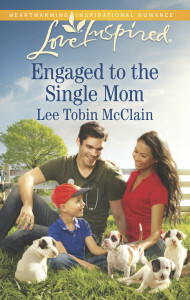 . .
Want to be entered into a drawing for a copy of Engaged to the Single Mom? Comment by Saturday, May 16th for one entry; share this post and double your chances to win (let me know in your comment how you shared it—FB, Twitter, or Pinterest all work). Thanks, Terrill! It’s not too late, but you’re right, it IS more work . . . I did another 1/4 of my garden yesterday and I am hurting today! So true! We do, too, and the tomatoes there are much better than anything I’ve been able to grow. You’re making me lazier! 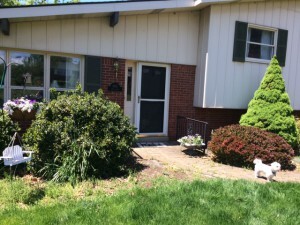 I am not a gardener or planter or any of that…and I don’t like fake plants! But I do admire others gardens, flower beds, etc! I guess I just wasn’t born with a green thumb :-) And I agree with Deanna, Farmer’s Markets are the best place to get fresh produce! I do have a cousin who does all that, grow most of her food and raise a few animals for meat. They also go hunting in the fall to stock their freezer for winter. Seems like a lot of work to me, but I bet it’s so much better for you that way. You know what’s in your food! Thank you for the chance to win a copy of “Engaged to the Single Mom”, sounds like a wonderful story! Trixi, someone needs to just sit and admire other people’s gardens . . . you’re playing an important role! Enjoy your hammock time this summer and I will put you in the drawing. Lee, I enjoyed your post. I haven’t learned how to garden in AZ yet. I’ve planted some flowers, but rabbits or something keep eating the tops right off. Soon the really hot weather will hit, and nothing survives except the native plants. Merillee, I bet Arizona gardening is a huge challenge! I have rabbits too, and was loftily informed by a far better neighborhood gardener that if my garden wasn’t so small, there would be enough lettuce for the critters and me, both! LOL. I smiled and nodded and realized I need to get my fence up around my tiny patch. Loved the post – you and I agree when it come to gardening. Please don’t put me in the drawing. I have a copy of this one and have read it and loved it. Give someone else the pleasure of receiving copy. Ann, thanks for commenting! I would have guessed you to be a master gardener! The closest I have gotten to gardening is that my daughter who lives out of state has just started a garden and her children are ‘helping’. I am wishing them luck, they will need it. You can cheer from afar! Narelle, you are Down Under, correct? I would love to know more about Australia’s weather and topography. I have the impression that it’s very beautiful and green and rural . . . or is that just a stereotype? Just popping in to say that I am the worst gardener. Thankfully my husband is super ambitious in that area. Boy do I wish I had been born with a green thumb. Blessings Lee.